Director: Curtis Hanson. Cast: Michael Douglas, Tobey Maguire, Frances McDormand, Robert Downey, Jr., Rip Torn, Katie Holmes, Richard Knox, Jane Adams, Alan Tudyk, Richard Thomas, Michael Cavadias, Bill Velin, Philip Bosco, June Hildreth, George Grizzard, Kelly Bishop. Screenplay: Steve Kloves (based on the novel by Michael Chabon). Twitter Capsule: Nicely tempered vision of middle-aged pathos; a comedy more rueful than farcical. Well-shot. Supporting actors sell it. VOR: ④ Rare to see field-leading talents (Hanson, Spinotti, Allen) commit to adult-targeted dramas that aren't somber Oscar plays. Craft in spades. Widely beloved. The modern literary adaptation lives! Ed. Jun 2014: The layers of retrospection keep accruing! I wrote the following review after revisiting Wonder Boys for an end-of-decade series on my blog; click the image of Naomi Watts below for other entries. That's why the piece doesn't do a lot of scene-setting. I'm writing for blog readers who definitely know the movie, and I'm stressing my own reassessment rather than describing the film as a whole. Still, five years further on, I'm surprised I was this grouchy. Maybe, yet again, the movie's virtues have just lingered better than the aspects that apparently sat poorly with me on this third trip through it. There's something to be said for a movie that remains such an overwhelmingly fond memory even after you've returned to it and considerably tempered your opinion. Photo © 2000 Paramount Pictures/Mutual Film Co. 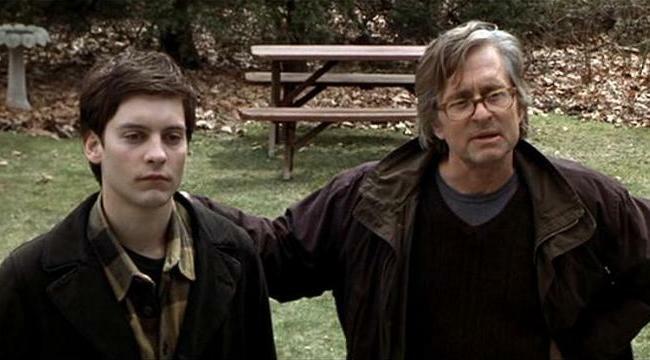 Though Wonder Boys happily foregoes a big soppy monologue on the subject, the movie is palpably fretful about what happens to complex, interesting, quietly ambitious people as they age. In further evidence of the movie's gentle, raffish, but sober wisdom, its vision of "getting older" does not mark a passage from youthful ease to dawning hardship or introspection. The moony writing student James Leer (Tobey Maguire) and the precociously articulate Hannah Green (Katie Holmes) have nearly as much on their minds as do their errant teacher-mentor Grady Tripp (Michael Douglas), or the warm but sharp-edged chancellor Sara Gaskell (Frances McDormand) with whom he's having an affair, or his charming rake of an editor Terry Crabtree (Robert Downey, Jr.). It's worth mentioning right off that Hannah has worries but not much in the way of actual shortcomings, and you could probably say the same about Sara. By contrast, James is soaked in hang-ups and worries, several of which he may have invented in pursuit of mystique or "artistic" suffering; you could probably say the same about Grady, a walking accumulation of several decades of literary listlessness. He coasts on at least some parcel of talent, on his students' admiration (increasingly limned with their skepticism about his personal life and neuroses), a good bit of marinjuana, and the carefully projected image of not taking anything too seriously. What this all means is that Wonder Boys really is about its boys, aware though it is of how men, even seemingly low-key men, narcissistically call attention to themselves. They aren't born interesting, and the film's actresses, to include Jane Adams as a doe-like waitress, do a gorgeous job of making the women register more richly than the script necessarily demands. The movie is also, inarguably, centered in middle-age, even as Holmes and Maguire exude a charisma that still reminds us, ten years later, of just how promising their careers looked well before his viability as a superhero-franchise star or her status as a gossip-page mainstay. These subtle but indisputable tilts in the movie's interests and empathies, accentuated by its dusky, wine-dark color palette and the wistful muffling of even its most farcical sequences (canine assassinations, madcap driving), are both the cause and the effect of privileging Douglas's Grady so strongly as the center of the film's gravity. You could imagine a recalibrated directorial approach that might have lingered less squarely on Grady, or a subtler, less self-conscious actor than Michael Douglas who might have made Grady the modest nucleus of a supporting cast that consistently matched him in energy and color. In the best sequences, Wonder Boys works exactly this way: Douglas and Downey's tacit pas-de-deux about whether or not Grady has completed his second manuscript, braided with another sidelong dialogue about why Terry has brought a transvestite as a traveling companion (and whether he even realizes it) yields a nuanced, engaging passage of acting, writing, and quietly artful filmmaking. A cocktail party at the house McDormand shares with her oblivious husband (just a smidge too buffoonish to blend with the movie's other characters) is another especially flavorful interlude. I hope it won't sound pejorative or snobbish to say how adult the movie feels at moments like this; indeed, these sequences bring the fun and the confusion back into the working definition of "adult," mindful of just how little these ostensible grown-ups have figured out. But the movie ultimately belongs to Grady, despite its impressive ensemble of actors; despite the script's welcome refusal to make the surrounding characters overly stereotypical or banal; and despite Dede Allen's generous and well-timed cuts that pull characters into groups rather than parceling them out as individuals. This emphasis on Grady becomes a problem. He narrates in voice-over, and even if he gets better lines from Chabon's novel and Steve Kloves's adaptation than offscreen narrators often do, this device deviates from the movie's core strength of understated characterization, substituting clunky assertion instead. Douglas reads with smug pride in the "literary" astuteness of what Grady says and how he says it, and though this could work easily as a character point, the self-satisfaction sounds too much like the actor's own. Grady inherits more reaction shots (winsome, sleepy, exasperated...) that the movie probably doesn't need, and Douglas gets punchlines and funny costumes to play with. He watches the typewritten pages of his massive, long-winded, long-gestating novel disperse in a strong breeze, like a flock of doves. The filmmakers treat this image as an earnest, even plaintive emblem of a life's work undone, and though their generosity is welcome, it also borders on the needlessly indulgent: Grady has deserved some pin-pricking comeuppance for a while. A little fun at his expense would not be out of order. By this point, the movie has achieved a poignancy about the difficulty of writing (and living) with real imagination, and the tolls that any long-term project ultimately entails, whether it's writing, teaching, or staying married. The image of Grady's windswept magnum opus makes good thematic sense, but only to the extent it resonates with so many other characters' disappointments and epiphanies, yet the film rarely if ever pauses so long on their crossroads moments, even or especially when Grady has brought them about. I was seduced by Grady and by Douglas's playing of him both times I saw the movie during its initial release; Wonder Boys prompted a friend to coin the phrase "a total seer-againer," which I still use all the time. I'm sure that I was, in part, relieved to see Douglas step away from all those lock-jawed archetypes of assailed upper-bourgeois masculinity that he chased incessantly after Fatal Attraction, and he settles engagingly into Grady's pilly textures and pot-scented air of distraction. On reflection, though, it's not an especially nimble or fully-shaded turn, and the film suffers from some sitcommy-ness in Douglas's playing. Director Curtis Hanson and photographer Dante Spinotti seem so much more interested in the human realities that permeate the surface zaniness, linking almost every character in a shared tendency to dramatize themselves, and to conceal a great deal even as they exhibit themselves in other ways. Douglas is playing one of many characters infatuated with their own myths, even when such behaviors cause problems, but Douglas alone seems a little infatuated with his part and with his own performance. Wonder Boys is, in many ways, such a welcome break from most Hollywood fare that one can hardly blame him for his giddiness, which he occasionally uses to enliven the performance, but which he too often allows to blur and overshadow the character's richer dimensions and the script's ideas. What Wonder Boys has in spades, beyond its heroic self-confidence as a dramedy about non-cartoonish adults (and academics at that! ), is a terrific sense of economy. You don't, for example, need to see much of the Grady/Sara relationship to glean a strong sense of its moods and backstories, just like you don't need more than one vertiginously high-angled shot of a wet slice of pizza, drooping over a porch railing in the rainy dawn, to glean a salient impression of the previous night's wild party. But Douglas's self-regarding persona and, I dare add, the story's and the script's notion of Grady seem much less contiguous than I remembered them being with that air of crystallized understatement. The movie pushes him at us, almost as much as that infamously awful poster did. Some of his facets never transcend feeling like "quirks" in the most familiar sense, as does his pink bathrobe, a wardrobe-prop that gets caught overacting. By contrast, within the film's pithy look at semi-graceless aging, McDormand and Downey have the ingenuity and the tact to make their characters vibrant and surprising without remotely overplaying them. Against the common homily that a good supporting performance is one that could easily be the center of its own film, I actually couldn't imagine such a movie about Sara or Terry, because the actors have laudably preserved the characters' mysteries. These are people who make their way through conversations and even major life-decisions without giving away much of their own interiority. The actors playing them haven't asked for a bit more attention than the movie needs. ★ Best Original Song: "Things Have Changed"